This summer, fold in romance into the sultry twilight BBQ, with a sensory wine, savory bone marrow sizzling on the grill that secretly laced with Umami, and a sultry summer playlist, created exclusively for you, rendering a fiery spark. We're talking about smoldering, mesmerizing fire. It dances. It destroys. Who hasn't been entranced by its transformative tricks—it's ability to caramelize everyday crackling vegetables into sweetly charred morsels; to plump raw meat to juicy, pink perfection? Like a lover's spell, fire renders its subjects irresistible to all five senses. Turn BBQ on high and let heat to 500F. Preheat Oven to 500F. Sprinkle LXV Spice Blend on the marrows. Cook in oven on center rack for 15-25 mins. To test for done ness, insert a metal skewer into the center of the bone. There should be no resistance when the skewer is inserted and some of the marrow will have started to leak from the bones. Foods that call for a wine with heartiness and structure, but not astringency - Braised meats (beef or venison), roasted meats, briskets, mushroom sauce. Sprinkle a little on any course: With bread and butter, on some fresh steamed vegetables, with popcorn, on mushroom ravioli. You could even sneak it into your creme brulee for a little sultry depth. Inspired by Aindrajala, the KamaSutra art of Magic, LXV Wine's 2013 Lover's Spell is strong enough to stand alongside this rich, seductive entree. A dynamic ruby red union of Cabernet and Syrah cascades into the glass, flirting first with the eye. Subtle hints of cedar, cigar box, and violet beckon the nose to chase this playful minx. Like a first kiss, the first sip tingles in the mouth as it warms in the belly. This bottle of elegant LXV Wine blooms into a wave of ripe figs, succulent Damson plums, and black cherry bliss. Like moth to flame, you are now within the grasp of a smoldering spell. If you're lucky, it will rage on into the balmy night. Decant LXV Lover's Spell for at least an hour, in a cool dark place. For a hot day, place the decanter in the refrigerator for 5 mins before serving. Regular Size (750ml): SOLD OUT! 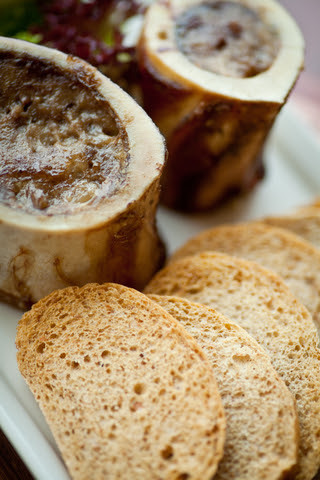 LXW wine paired with bone marrow is the perfect anniversary present my husband will be recieving next weekend. Looks so mouth watering! I cant wait to get my hands on this.